Christmas is my favorite time of the year for so many reasons, but one of them is that I absolutely love giving gifts. Now that I work full time and will only have a couple of days off around Christmas, I'm really trying to get my Christmas shopping done early this year! I figure that planning ahead and spreading out purchases will help me stay on budget and keep my stress level lower (because who wants to spend the Christmas season stressed?). I put together this chic + cheap guide to gifts for your gal pals and everything is $30 or [much] less! My friends and I usually set a rough price limit on Christmas gifts for each other since there are so many gifts to buy this time of year. A smaller budget doesn't mean you have to sacrifice giving an amazing and classy gift though! When putting together this post I found so many chic little gifts for even the smallest of budgets. These are all such great ideas, perfect list! the golf brush set is a dream. 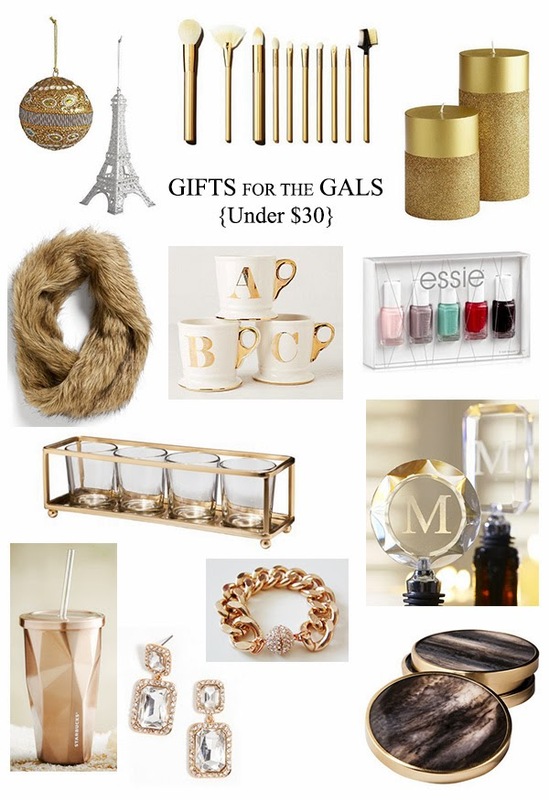 Love these gift ideas, loving that fur scarf and monograph mugs!!! That faux fur scarf is amazing! I would love to get that! Love these picks for the holidays and for gifts. Thanks for sharing. I MUST GET THAT FUR SCARF! I can't believe it's only 24! Saw the Anthro mugs not too long ago and about lost it. They're wayyy beautiful. Such a great list Jacy! Great edit J, loving the monogram mugs for something a little different and special. I should also probably start on the Chrissy shopping early... I always leave it to the last minute lol! Thanks for the ideas! I love the brush set and monogram wine stopper!